Family, friendship, betrayal and deception. The wise, we are told, forgive but do not forget. Jane, slowly recovering from the shock of her husband Neil’s sudden death three months ago, is looking forward to a weekend visit from Fran – her friend and the mother-in-law of her daughter, Lucy. But almost before the weekend gets under way, Fran goes missing – a seemingly inexplicable happening which throws Jane’s life and those of their inter-related families into turmoil again. In the months following this traumatic weekend, as one guilty secret after another comes to light, she is forced to re-assess both her marriage and her relationship with Fran. The End Of The Road is a novel about family relationships, friendship, betrayal and deception. The wise, we are told, forgive but do not forget. But is forgiveness ever really possible when some things are impossible to forget? 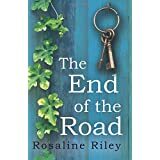 I enjoyed The End of the Road; a good holiday read with a plot of twists and turns, some I could guess, some that took me by surprise. Rosaline Riley has an interesting and skillful writing style, giving detail to each event in the novel to keep the reader interested enough to keep following the story. The characters are mostly well drawn and many-layered to some depth and the relationships between them works well on the whole. Both the internal and spoken dialogue works well and it is possible to differentiate the characters,even without the dialogue tags. I did enjoy the descriptions of the settings; these give a good sense of place. As I said, a good light holiday read for those who like to read about families and relationships. And did I mention i loved the cover? I’ve actually had the pleasure of interviewing Rosaline Riley: after I read her other novel, Clad in Armour of Radiant White: http://amzn.to/2feAlTC. Although I’ve enjoyed both books and do like this author’s style of writing in each I preferred this last mentioned book best.